As a result of a Tax Court decision in 2014 (Bobrow v. Commissioner, T.C. Memo 2014-21), the Internal Revenue Service (IRS) has stated in Announcement 2014-15 that it will follow the result of that Tax Court case starting on January 1, 2015. The Tax Court interpreted IRC Section 408(d)(3)(B) to mean that only one non-taxable IRA to IRA rollover (60 day window) is permitted in a 365 day period for any individual no matter how many IRAs that individual owns. The IRSs new IRA rollover rules are a significant change. Previously, IRS Publication 590 (Individual Retirement Arrangements) and Private Letter Rulings had stated that if an individual owned more than one IRA, the 60 day “rollover” rule applied separately to each IRA owned by that individual. IRAs can be either IRA Accounts (i.e. mutual funds or bank CDs) or IRA Annuities (i.e. insurance companies). What does this new IRA rollover rule mean from a practical point of view? First, the term rollover must be clarified. A rollover takes place when an IRA provider makes a distribution check payable to the IRA owner personally. That IRA owner then has 60 days to place those funds into a new IRA account to avoid taxation on the distribution. A rollover differs from a direct transfer where an IRA provider transfers an individual’s funds directly to a new IRA provider. In a direct transfer, the IRA owner never receives a distribution of the funds since the direct transfer check is made out to the order of the new IRA provider for the benefit of the individual. This situation is sometimes called a trustee to trustee direct transfer. With this difference between a rollover and a direct transfer more clearly defined, what type of IRA to IRA transactions will or will not fall under this one new rollover per year rule? An individual is allowed to make unlimited direct transfers from one IRA provider to another IRA provider. Both the Tax Court and IRS Announcement 2014-15 state that taxpayers have no limit on the number of direct transfers that can be made between IRAs. 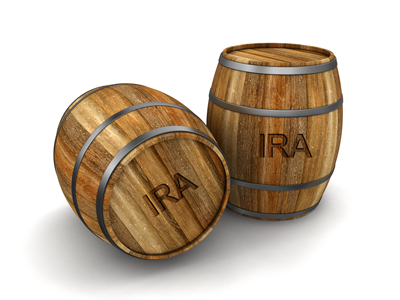 All types of IRAs under IRC Section 408 must be taken into consideration for purposes of the new IRA rollover rules. It’s important to consider what would happen if the new one rollover per year rule is violated. If it’s determined that a second rollover has taken place within a 365 day period, then the full amount of that second distribution will be taxable income. If the IRA owner is under age 59 ½, there will be an additional 10% penalty tax. The Tax Court decision and the revised IRS position on rollovers have restricted an IRA owner’s ability to access his or her IRA funds on a short-term, tax-free basis. Depending on the facts of a client’s personal situation, it could make sense for that client to own multiple IRAs that serve a different retirement and estate planning purposes. Clients and their advisors will have to use great care to comply with the new IRA to IRA rollover rules. The easiest way to comply with this rule and avoid unpleasant tax consequences is to make a direct transfer from one IRA to another IRA whenever possible. As previously mentioned, an unlimited number of direct transfers are permitted. Contact your BSMG Annuity Advisor whenever contemplating a rollover of one IRA for another IRA to make sure your client stays in compliance with the this rule.